Yesterday, I made chili with chicken for the first time. It turned out delicious and I was left with NO leftovers. I am definitely going to make this again. If you like chicken and you like chili, be sure to try this chicken crock pot recipe too! In a large bowl, mix the cornmeal, chili powder, oregano, cumin and salt. Once mixed, add chicken and toss to coat. Pour chicken mixture into crock pot. 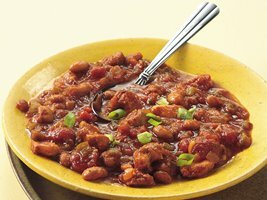 This recipe was adapted from Betty Crocker’s Slow Cooker Southwestern Chicken Chili!